By Erin Harvey, Junior Editor for jaBlog! We’ve all come across them—the character that’s too perfect, often an idealistic representation of the author, lacking in both flaws and unique features. Mary Sue, originally discovered in fan fiction, has crept into the movies we view, the books we read, and, unfortunately, the stories we create. From personal experience, I understand that many young writers have difficulty coping with Mary Sue. Because she is such a common cliché, young authors like us need to take extra care to avoid her. 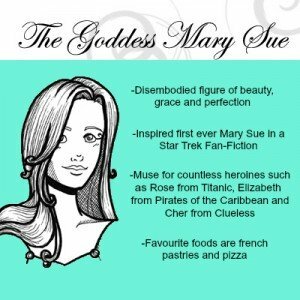 Mary Sue is defined as a perfect character. She lacks in realism, having either no flaws or flaws that merely add to her impeccable image. Her beauty is practically unnatural, and it is common for her to have extraordinary powers. All of the supporting characters fawn over her. If they do not, it is a general implication that they are wicked. She is often a representation of what the author wishes they were, and she is regularly the result of self-insertion. Don’t be fooled by her gender. Mary Sue can also appear in male form. As much as we wish it to be true, we aren’t perfect. Our flaws, failures, and irrational decisions make us human. The main issue with Mary Sue is her complete absence of faults. She’s the type of character who makes us scoff at everyone’s immediate love for her when we know it isn’t possible. It creates an unrealistic atmosphere, detaching the reader from the story. Mary Sue crushes any relation the reader may have formed with the characters. A connection cannot be created with a character with who we share nothing in common. This disinterest in the story, no matter what the plot, is all thanks to Mary Sue. One of the major reasons Mary Sue infiltrates a story is because the author simply does not notice her. The author is likely to fail to realize that the character in his or her mind did not transfer to paper. Some authors may even deny the unrealistic flawlessness of their character. Having close family members or friends read through the story will allow indicators of Mary Sue to be noticed and eliminated. Mary Sue can also be caused by the author trying to force a scene or plot point to occur. He or she may try to mold their characters into a fashion that leads to the desired outcome. Instead, this often causes clichéd characters to take shape as a result of the forcible manipulation of their personalities. Before they are written, stories are not set in stone. They must be allowed to form and flow on their own. Rigid outlines can prohibit the story from fully expanding, and it may even result in the dreaded Mary Sue. Erin Harvey is a fifteen-year-old writer from Florida. She is the junior editor for jaBlog! You can read some of her work online at http://figment.com/users/302164-Erin-Harvey. Age 16. Longwood, Florida, United States of America. Currently enrolled in high school, Erin has had several articles and a short story published on jaBlog! She also published one of her poems, won several school essay contests, and has been a finalist in a writing contest. This summer, Erin was accepted into a special week-long writing workshop at the University of Iowa. She was also recently added to the editorial team of her school’s new literary magazine.